During the 13 years, 1904 to 1917, the movement developed that gave birth to the Argentine Mennonite Mission. Mennonite youth in Goshen College studied about the neglected South American continent. Churches and individuals contributed to a fund for South American missions. The Mennonite Board of Missions and Charities in 1911 sent J. W. Shank as its representative on a six months' tour of investigation in Peru, Bolivia, Chile, Argentina, and Uruguay. Then followed a general solicitation campaign that brought over $20,000 for the new mission. By the late summer of 1917 the four missionaries under appointment, the T. K. Hersheys and J. W. Shanks, sailed to Buenos Aires, arriving on 11 September. 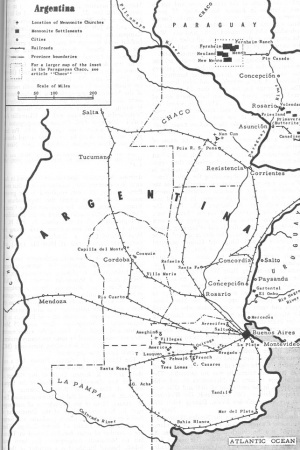 The task before these novices was to survey the great Argentine field and choose a strategic region for the proposed mission. After 14 months of language study, during which time also the missionaries made extensive survey trips in the interior, they chose the rich agricultural region some hundreds of miles directly west of the capital. The transfer to Pehuajó, the chosen center for the new mission, was made early in 1919. The task of evangelism inaugurated in Pehuajó in April 1919 continued through the years with varying degrees of confidence and enthusiasm. At the end of the first decade, seven growing churches were in existence and from these, outstations and branch Sunday schools were being nourished. At the end of the second decade the work had extended into 3 provinces with 14 outstations receiving attention from 8 central churches. At the end of the third decade there were 13 main stations and 25 outstations. During the last part of this decade the mission to the Chaco Indians, 1,000 miles north, was opened. By 1953 the total membership had reached 650 while the church community attendance at services reached approximately 1,500. During its first 35 years of existence the mission acquired 28 properties valued at 480,555 Argentine pesos. Among these properties there were 14 churches, 17 pastoral homes, 2 children's homes, and a Bible school. The working staff in 1952 consisted of 27 missionaries and 20 native Christian workers who gave all their time to religious or educational work. The original policy of the Mission was to evangelize the people of the rural regions and not to seek locations in Buenos Aires. After 25 years, however, it became necessary to form in Buenos Aires a church composed of Mennonite families and individuals who had moved to the great city. With the exception of this one church, all other churches are located in progressive rural towns and villages. Only the Chaco Indian mission was entirely rural. This conference was first organized in 1923 by missionaries of the Mennonite Board of Missions and Charities, and was composed of all bishops, ministers, missionaries, appointed national workers, one delegate for each congregation up to nineteen members and two for congregations of twenty or more throughout Argentina. While the custom had been to hold yearly meetings, this changed to biennial meetings in 1942, due to the high cost of bringing together the delegates from such widely separated zones and districts. In the alternate years the general young people's institute met, at which time a pastors' meeting usually was convened to take care of any necessary reorganization or business. As recently as the 1950s, all these meetings were held in the splendid eucalyptus campground near Trenque Lauquen. All properties and institutions of the Argentine Mennonite Mission described above were transferred to the Iglesia Evangélica Menonita, Argentina. Membership, reported at 650 in 1953, had reached 2,000 by 1988, with regular attendance at services totaling more than 3,000. Approximately 30 congregations were served by Argentine pastors, most of whom earned their own support. A few were paid salaries by their congregations. In 1988 one couple supported by Mennonite Board of Missions (Mennonite Church) was working in leadership training. The Argentine Mennonite Church was growing toward maturity and responsibility. Several congregations were located in Buenos Aires. Shank, J. W., et al. The Gospel under the Southern Cross : a History of the Argentine Mennonite Mission of South America, Celebrating its Twenty-fifth Anniversary, 1917-1942. Scottdale, PA: Mennonite Publishing House, 1943. Shank, J. W., Elven V. Snyder and Raul O. García. "Iglesia Evangélica Menonita, Argentina." Global Anabaptist Mennonite Encyclopedia Online. 1987. Web. 22 Apr 2019. http://gameo.org/index.php?title=Iglesia_Evang%C3%A9lica_Menonita,_Argentina&oldid=118357. Shank, J. W., Elven V. Snyder and Raul O. García. (1987). Iglesia Evangélica Menonita, Argentina. Global Anabaptist Mennonite Encyclopedia Online. Retrieved 22 April 2019, from http://gameo.org/index.php?title=Iglesia_Evang%C3%A9lica_Menonita,_Argentina&oldid=118357. Adapted by permission of Herald Press, Harrisonburg, Virginia, from Mennonite Encyclopedia, Vol. 1, pp. 154-156; v. 5, pp. 414-415. All rights reserved. This page was last modified on 12 April 2014, at 03:17.